If you have not already done so, download the CData API Server. 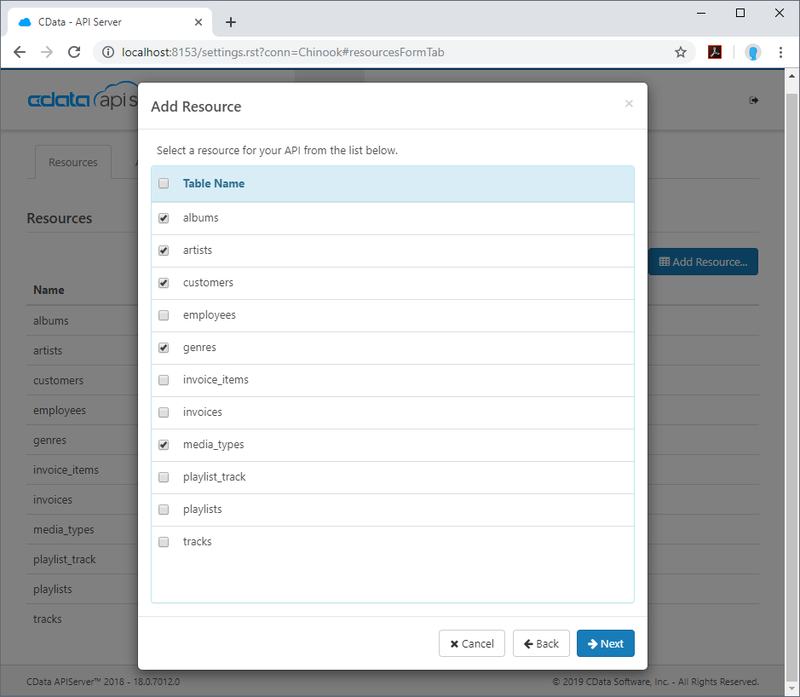 Once you have installed the API Server, follow the steps below to run the application, configure the application to connect to your data (the instructions in this article are for the included sample database), and then configure the application to create a REST API for any tables you wish to access in your React app. Click the checkbox to enable cross-origin resource sharing (CORS). Either click the checkbox to allow all domains without '*' or specify the domains that are allowed to connect in Access-Control-Allow-Origin. Navigate to the Connections tab on the SETTINGS page. 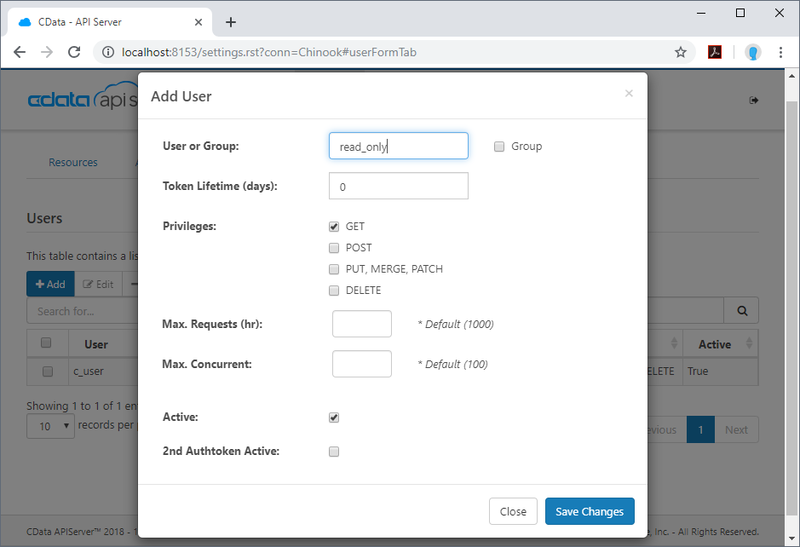 Configure the connection in the resulting dialog: Name your connection, select SQLite as the database, and fill the Database field with the full path to the SQLite database (the included database is chinook.db from the SQLite Tutorial). Next, create a user to access your database data through the API Server. You can add and configure users on the Users tab of the SETTINGS page. In this simple React app for viewing data, create a user that has read-only access: Click Add, give the user a name, select GET for the Privileges, and click Save Changes. Click the Add Resources button on the Resources tab of the SETTINGS page. Select the data connection you wish to access and click Next. With the connection selected, enable resources by selecting each table name and clicking Next. 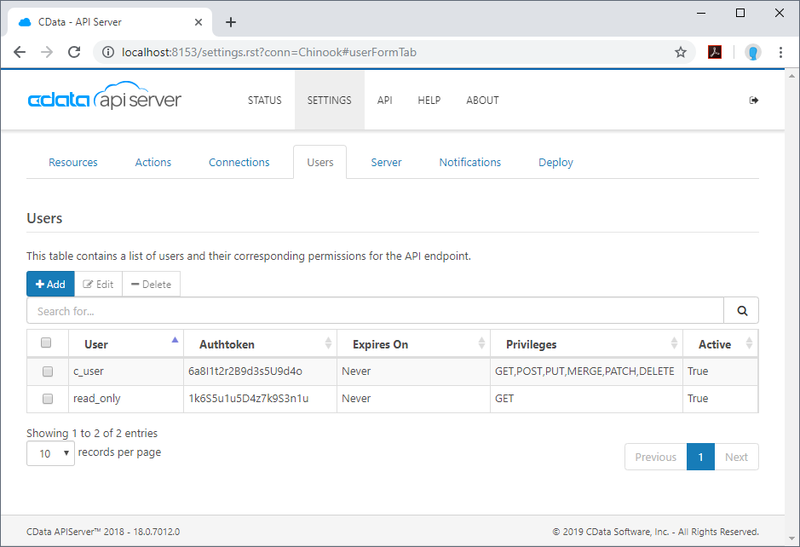 Having configured a connection to the database, created a user, and added resources to the API Server, you now have an easily accessible REST API based on the OData protocol for those resources. Below, you will see a list of tables and the URLs to access them. For more information on accessing the tables, you can open the API page from the navigation bar. To work with React, you can append the @json parameter to the end of URLs that do not return JSON data by default. With the API Server setup completed, you are ready to build the sample React app. The following steps walk through the source files for the React app contained in the .zip file, making note of any relevant sections of code. This is the home page of the sample React Web Application. It fleshes out the HTML head and body and identifies the container and the script to use to display the Web application. This TypeScript file imports the necessary libraries, modules, and the React class. The properties, or props, for the main React class are defined here as well. This JSON file contains the properties, including dependencies, of the React app. This file is generated automatically. The constructor of the App class. In it, the state contains the dynamic data used to build the Web app. You can also bind other methods on this so that you can modify the state within those methods. As per the React specification, the componentDidMount method is called before the render method and can be used to update the state variables of the app, after the constructor has run. In this method, you can send the HTTP request to the API Server for the list of tables and set the tables and selectedTable state variables. In the sample, a call to the getColumnList method retrieves the list of available columns for the first (and currently selected) table. This function retrieves the list of columns available for the selectedTable parameter (or the table currently selected in the UI if the parameter is undefined). It performs the HTTP request and parses the response, setting the columns and selectedColumns states. This function uses the tables state variable to build out the options for the HTML drop-down select for selecting a table. This function uses the columns state variable to build out the options for the HTML multiselect for selecting columns. This function provides the basic framework for the HTML table based on the data retrieved from the API Server. It uses two helper functions, renderTableHeaders() and renderTableBody(), to build the table headers and data rows. This function uses the selectedColumns state variable to build out the headers for the HTML table used to display the data from the API Server. This function uses the tableData and selectedColumns state variables to build out the data rows for the HTML table used to display the data from the API Server. This function retrieves the data from the API Server, building a list for the $select parameter based on the selectedColumns state variable and using the selectedTable state variable to determine which resource to request data from. 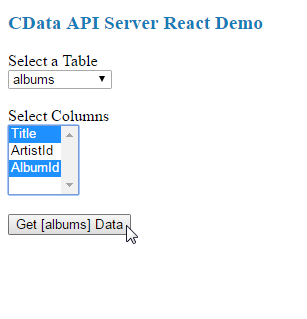 The data returned by the API Server is stored in the tableData state variable. This function handles the change event on the HTML drop-down select for choosing a table. In the function, the selectedTable state variable is set to the selected value and the tableData state variable is cleared of all values. Also, a call to the getColumnList function updates the HTML multiselect element for choosing columns. This function handles the change event on the HTML multiselect for choosing columns to retrieve and display. After determining which columns are selected, the selectedColumns state variable is updated and the tableData state variable is cleared. This function is the function that controls the layout and display of the various HTML elements. It contains all of the static HTML features, as well as function calls to those functions that render the dynamic elements. 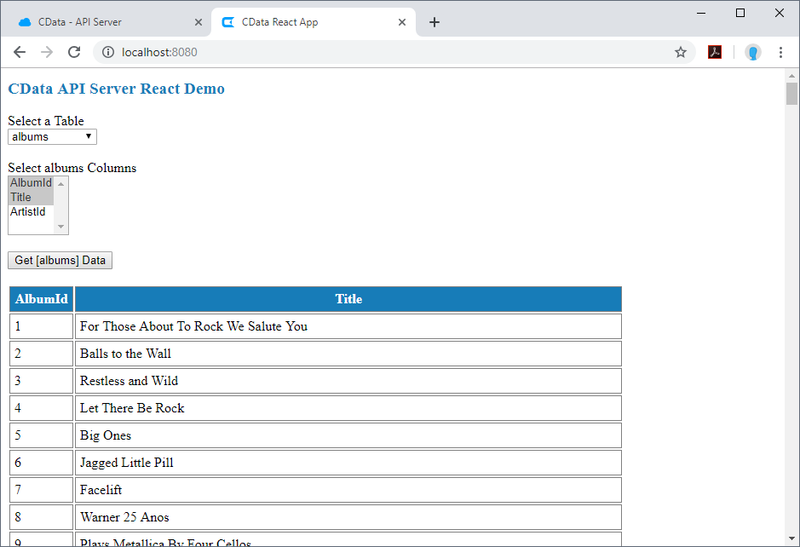 With the connection to data configured and the source files for the React app reviewed, you are now ready to run the React Web application. You need to have node.js installed on your machine in order to run the React app. There are several modules that you also need to install before you can run the application. In the next steps you will set up your React project, creating and populating your package.json file. When the React app launches, the title and a drop down menu to select a table are displayed. The list of tables is retrieved from the API Server and includes all of the tables you added as resources when configuring the API Server. When you select a table, the drop-down, multiselect menu for columns appears, and you can then select the columns you wish to see in your table. As you select columns, the table headers appear. 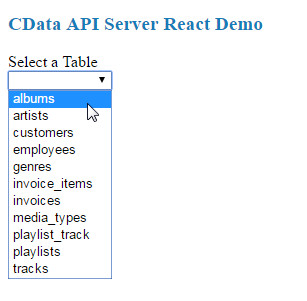 Once you select the table and columns, you can click the Get [table] Data button to retrieve data from your database via the API Server. The HTML table will be populated with data based on the table and columns you selected before clicking on the button. 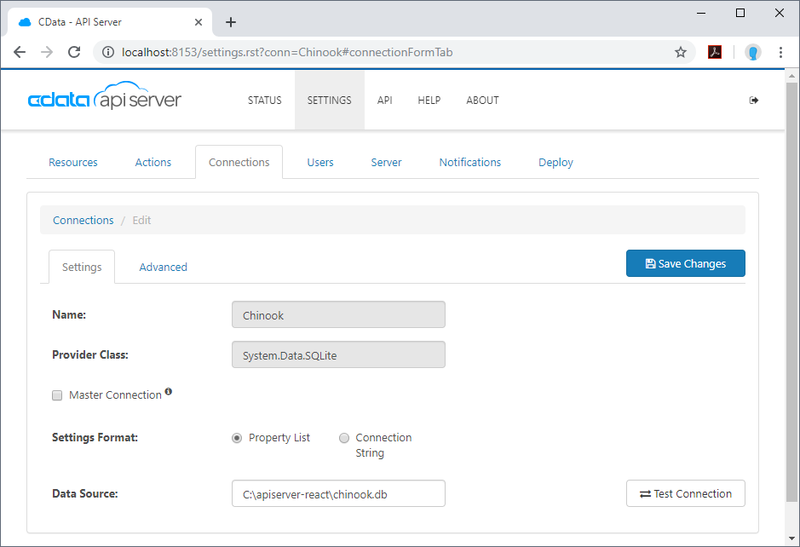 Now that you have accomplished the steps needed to connect to your database data in dynamic Web pages, download the API Server to start building dynamic Web pages using live data from your on-premises and cloud-based databases, including SQLite, MySQL, SQL Server, Oracle, and PostgreSQL! As always, our world-class support team is ready to answer any questions you may have.